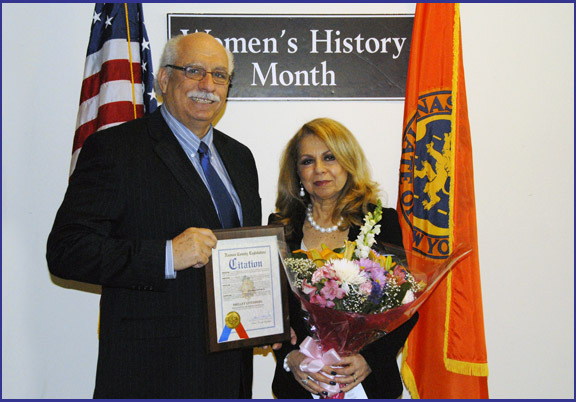 Legislator Dennis Dunne, Sr. was proud to honor Rachelle (Shelley) Lotenberg at the Nassau County Legislature’s Annual “Women of the Millennium” Awards Ceremony. Legislator Dunne presented the “Trail Blazer of the Year” Award to Rachelle (Shelley) Lotenberg to acknowledge her accomplishments as Director of the Public Affairs Department at Nassau Health Care Corporation (NuHealth) System. The NuHealth System is comprised of the Nassau University Medical Center, the Holly Patterson Extended Care Facility and five Family Health Centers located throughout Nassau County. Shown in photo: Legislator Dunne and honoree Rachelle (Shelley) Lotenberg.